Every three years the German Agricultural Society announces the winners of the International FoodTec Awards. This year 18 companies were awarded gold and silver for innovative systems and processes in both the international food production and supplier industries. Award winners include companies from the Netherlands, Denmark, Canada, Austria and Germany. 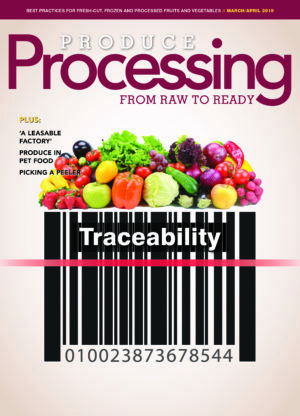 Five innovations, in particular, relate directly to produce processing. To earn its award, Krones developed an innovative solution called VarioSpin to some of the problems presented when bottling fruit juices. Without proper de-aeration, several problems can occur, including oxidative reactions and floating fruit particles. During the process, it is important to keep the surface area as large and turbulent as possible, and to keep layers as thin as possible. This helps to keep the diffusion paths for gas bubbles short. To limit the amount of foam produced during this process, however, juices need to be subjected to the least amount of mechanical stress possible. Currently, many companies use annual, spray and tangential nozzles, but they do have drawbacks. Krones’ “swirl in-feed” addresses some of those drawbacks as it is designed to gently apply product to the wall of the de-aeration tank, starting at the specially constructed container lid. Using the surface of the container (and the lid) reduces the volume of the container by more than one-third, which saves both space and energy since the vacuum pumps can be smaller. The turbulent product film is said to allow for a high rate of gas exchange, which achieves low residual oxygen levels – even at higher viscosities. As most produce processors well know, fresh fruit and vegetables continue to breathe after packaging. The process uses oxygen and produces carbon dioxide and water vapor, all of which is heavily influenced by outside factors, like temperature. Earning it its gold award, Perfo Tec has designed a respiration control system that includes four steps: the measurement of breathing ability, calculation of film permeability using the AMAP software, laser perforation of packaging film and quality control via an integrated camera that monitors perforation. The end result is a product with increased shelf life. Recognized for its DirectDrive System, Intralox is one of nine International FoodTec silver award winners. In conventional overdrive spiral conveyor systems frictional force can lead to the misalignment of products on the conveyor belt. The Direct Driver System, on the other hand, uses a system where the belt is driven directly by the drum, which works in the system like a central cog, thereby eliminating slippage because there is no longer any friction between the edge o the belt and the drum. What this does is ensure the uniform alignment of products on the belt and reliable operation without any contaminations from the drum. Earning its prize in silver, Linde AG has developed a new generation of freezers called the CRYOLINES SI. Designed mainly for high-grade, loose-rolling food, the freezer is a combination of an immersion bath and a post-cooling tunnel. It has the capacity to process up to 1,000 kg per hour. Product is fed directly into the immersion bath using a vibrating conveyor belt, which works to reduce lumping of product. Cold liquid nitrogen is used to instantly crust-freeze and stabilize product surface. This effectively locks in moisture, which helps to maintain both quality and yield. To use as little liquid nitrogen as possible, the immersion bath has a shallow design. Cold gas energy from the immersion bath stage is further used in the post-cooling tunnel – a step that both increases efficiency and saves time.